The French mountaineer, Pierre Beghin, died last month whilst attempting a new route on the South Face of Annapurna. He and his partner, Jean-Christophe Lafaille, had reached a highpoint of about 7,400m when bad weather forced them to retreat. On October 11th Beghin had just started an abseil when the anchor failed and he fell over 1,000m. He was almost certainly killed in the fall and his body has not yet been recovered. Lafaille was left to descend the face alone, with only a very short length of spare rope, in appalling weather. During the descent his arm was broken by a falling rock and five days passed before he reached the bottom of the face, where he was helped by a team of Slovenian climbers. At 41 Pierre Beghin was a household name in France; in international mountaineering circles he was universally recognised as one of the world’s most brilliant Himalayan climbers. Beghin was born in Rotterdam but his family soon returned to France, where his studies culminated in an engineering degree at the Ecole des Mines. At about this time he started climbing and by the early seventies he was emerging as one of France’s most dynamic Alpinists, making fast solo ascents of difficult routes and, more significantly, first winter ascents of some of the hardest routes in the Massif de Mont Blanc and Massif des Oisans. His winter firsts included the Boccalatte Pillar on Mont Blanc du Tacul, the Bonatti/Vaucher on Pointe Whymper, the Gervasutti on the Ailefroide NW Face and (solo) on North Face Direct on the Pic Sans Nom (Oisans). At that time Alpine winter climbing was still comparatively new. In contrast to today’s helicopter maintained circus, those winter climbs were slow, cold affairs, usually lasting five or six days, with difficult appoaches on skis or snowshoes. Speaking recently on the BBC TV Climbers series, Beghin reminisced about the “poetic” nature of those winter journeys with their long lonely bivouacs under the stars. That “poetic” approach combined with skill, stamina and ambition needed new challenges. 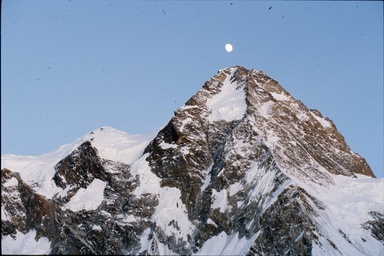 Beghin’s first Himalayan expedition was an almost successful attempt on the magnificent Uli Biaho spire in 1974. In 1977 he was frostbitten on a Manaslu attempt, but felt recovered enough the following summer to climb in the Andes. In 1979 he was back in Pakistan with Seigneur’s expedition to K2. That summit eluded him as did Dhauligiri in Nepal the following year when he and Bernard Muller reached the top of the very hard South Pillar but were driven back by blizzard conditions from the actual summit. By now Beghin knew that he performed well at altitude. He had also discovered an antipathy to huge overmanned expeditions (the K2 expedition employed 1,500 porters to get to Base Camp). After 1980 he organized his own projects, always sticking to a small efficient team, often climbing with just one partner, or even alone. For the next 11 years, Pierre Beghin played a successful balancing game, resisting the temptation to go professional. For two or three months each year he pursued his “passion” in the Himalaya, climbing at the very highest standards; at home near Grenoble, where he lived with his wife Annie(also a distinguished mountaineer) he stuck to his job as a research engineer with the Association National pour l’Etude de la Neige et des Avalanches. In terms of peak-bagging statistics, his Himalayan record was not the most impressive, nor did he resort to the fashionable gimmickry of racing up, jumping off and surf-boarding down the highest peaks. True, most of his expeditions were to the prestigious 8,000m peaks, but he did not slavishly follow the treadmill to “tick”, all 14 as quickly as possible. For him it was the nature of the journey that counted – Manaslu by a difficult new route up the unknown West Face in 1981, Kangchenjunga solo, Lhotse South Face attempted bravely but unsuccessfully with just one companion, Christophe Profit in 1990. He devoted two seasons to the magnificent, inspiring North Face of Jannu – a peak that lies well below the magic 8,000m level, Everest eluded him three times but he had plans to return next year; on K2 he soloed high on the North Ridge from Sinkiang then returned in 1991 with Profit, this time traversing round from Pakistan, starting up the NW Ridge and finishing up the N Ridge to the Summit. Beghin’s most daring climb was probably his solo ascent of the massive South Face of Makalu in 1989. The expedition was an official celebration of the 200th Anniversary of the Revolution, with President Mitterrand as patron and the inevitable satellite link to the media. Beghin was ambitious, maybe even ruthless, and he knew how to get the limelight; but he was also charming, witty and generous. It was typical that after his attempt on Lhotse South Face in 1990 he refused to join in the wide spread scepticism about Tomo Cesen’s ascent earlier that year. 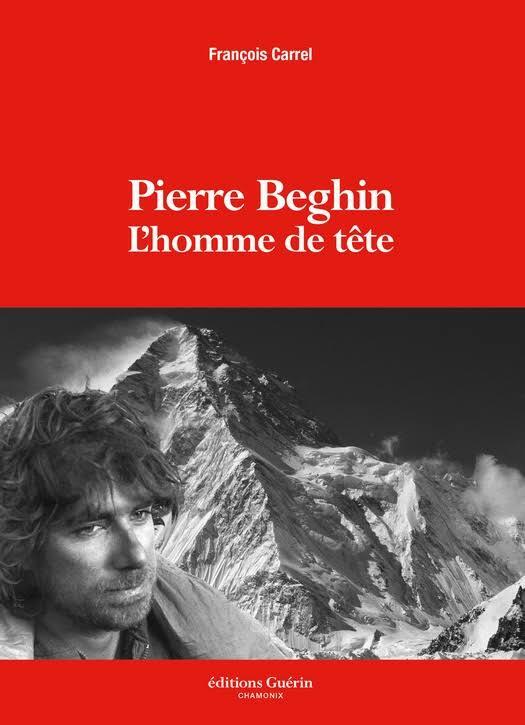 Pierre Beghin was one of the world’s most outstanding mountaineers. He was still in his prime, with many exciting plans waiting to be fulfilled. He was a great inspiration and the climbing world will miss the exuberance and imagination of his climbs, his writing and his excellent photographs. Our sympathies go to his family, especially his widow, Annie.